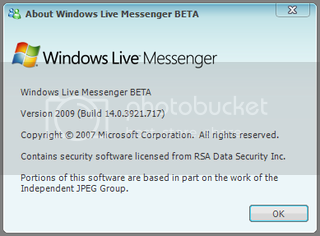 Windows Live Messenger Build 14.0.3921.0717 Leaked. Thread: Windows Live Messenger Build 14.0.3921.0717 Leaked. Windows Live Messenger 2009 (fka. v9) appears to have been leaked. The build number, however, has surprised most, already being at 14.0.3921.0717, clearly not following the common path. In this build, the first thing you will notice is a relatively restyled user interface, but not entirely revamped. While some areas have remained fairly consistent with 8.5 such as the contact list, other areas such as the conversation window, have had a good makeover. In the new feature department, well, it was sort of like turning the handle on a jack-in-the-box for 2 minutes only to find out he was no longer inside. So far, the only two new features that have been discovered is a new photo sharing utility that allows contacts to share and browse photos simultaneously, as well as a new "Group" feature, which allows you to create a never ending group conversation which essentially re-invites the same contacts every time the "group" is initiated, unless a contact decides to opt-out. However, this feature just doesn't seem to want to work in this build. Download Link, Screenshots and More at JCXP. BTW, this appears to be an Old M1 Build of Messenger ! It took 1 year for WLM team just for interface change? Pathetic. Personalisation – We’ve talked about the new Wave 3 header before, but what we haven’t really talked about is how it can be personalised. With Wave 3, the header allows for theming across Windows Live using “scenes”, meaning that the UI you see in Messenger is also the UI you see on the web. As the image on the right shows, users can select their own background image – maybe its time for some LiveSide themed screenshots? This was discussed in one of our first ever interviews with Phil Holden over 2 years ago, so its great to see this finally come to fruition. Simplified header: As well as having the new Wave 3 UI, the header at the top of the contact list has also had a redesign, removing a lot of the clutter. Gone are many of the buttons like Windows Live Call, Windows Live Today, Spaces, Mobile messaging etc, leaving just a simplified Hotmail notification icon on the right hand side. This is something we’re not so surprised about, we heard a while ago that usage of these extras was very low (think <1% of all users). Here’s the Messenger v8.5 header for comparison. Improved Personal Status Message (PSM) – The PSM was first introduced in Messenger v7 along with the music PSM, showing your contacts what you are listening to. Since then not much has changed, despite some intrepid investigators noticing that there are Office and Games icons contained within Messenger for use in this area. With Wave 3 this upgraded PSM allows users to show both their regular status and music updates at the same time. The new buddy icons - There’s two parts to this. The most obvious point is the removal of the messenger buddy icon to be replaced with a coloured tile. Then there’s also the new new online presence indicator, which both colours the tiles and surrounds display pictures in the form of a glow. See the Favorites at the top of the contact list for an example of this. Presumably green is available, orange is away and red is busy - could we also see this implemented at the top of the new Wave 3 header for online services? The “What’s new feed” - This is my pick for underrated killer feature. Much like the existing Spaces homepage and the Facebook news feed, this displays notifications showing what your contacts are doing. Check out what playlists your Zune friends have made, or what files they’ve added to Skydrive for example. This should drive cross-platform integration in a big way, and turn Windows Live into a truly cohesive web platform. Can you tell I like this? See also the individual contact feed in the conversation window showing new photos are being shared online. Tabs – No not the kind you chat through, the kind that links to other online services which Microsoft wishes to promote. These have been moved from the side of the contact list down to the bottom, just above the advertisement, saving screen real estate and making them less intrusive. Windows live for mobile is also available at windowsliveformobile.com u can access that from there , just have to add your mobile no and Microsoft will send you link.